Photographer(s) Appreciation: Thank you to retired UBC Botanical Garden staff member David Tarrant for today's photograph. It was taken in El Charco del Ingenio in San Miguel de Allende, Mexico. Thanks again, David! The genus Matelea contains approximately one hundred and eighty species distributed in subtropical and tropical areas of the Americas. Collectively, these twining vines are known as the milkvines, a common name similar to their cousins the milkweeds (the genus Asclepias). Matelea pilosa is a relatively unknown species (few search engine results, no common name), but the Neotropical Herbarium Specimen database at the Field Museum does have a scanned specimen online. Wonderful picture. What an amazing beast! Interesting texture to the large petals, or perhaps they are sepals. I did an image search for ‘matelea’ and found another species with strongly textured, tough looking petals/sepals and one with a very hairy surface to the same surfaces. Daniel or anyone else know what the unusual textures in this genus are thought to be about, anti-dessication, whatever? Thanks, David for the powerful image! 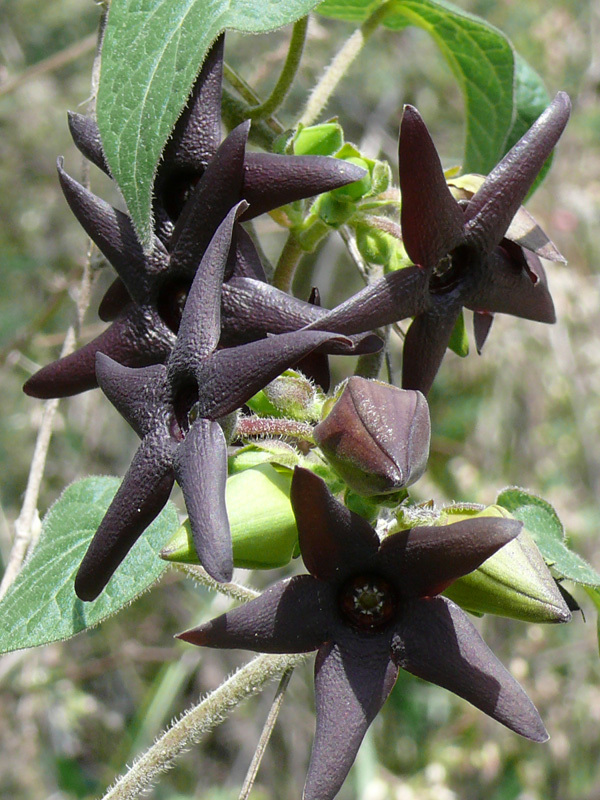 So we could name this the “chocolate milkvine” and no one could argue? Resembles a stapelia…. is it also smelly ? Thank you for such a lovely picture. It is so nice to enjoy such beauty and to be learning at the same time. The un-opened flower resembles the common Bloon flower grow in gardens in this part of western Massachusette. Thanks so much for the picture. The flowers look a little like the flowers an odd looking plant I have here look. Nice to see something new. Hi George, I’m afraid I don’t know the details of the flower texture. I had a look through Zomlefer’s Guide to Flowering Plant Families and didn’t come up with anything that was suggestive. Dessication shouldn’t be an issue in the subtropical / tropical climates the genus is found in. Jaro, I don’t know about the smell, either. Maybe David will post a reply. And Andrea, if you want to call it chocolate milkvine, I don’t think anyone could complain too vociferously. It sure resembles chocolate. Me gustaria agradecer por la determinacion de la especie, ya que hace 3 años, en Leon Guanajuato, encontre la misma especie, en un matorral subtropical con elementos de Bosque Tropical Caducifolio, y solicite ayuda para su determinacion, pero no logre llegar hasta la especie.